My first trip to Disneysea this year was met with a mob of Japanese carrying what appears to be random teddy bears from a shop that could at best be called “Gift Shop”. But if over 80% of the crowd at Disneysea is carrying at least one of it, as much as it looks un-Disney, it must be from Disney or I must have been hallucinating. I saw a lady holding the tiny hands of her little toddler walking by her side while pushing a pram with 4 of those bears tucked comfortably into a warm blanket and 1 pink one sitting above the sunshade. I looked at the faces of the bears and thought, “Ah, it must be that the bear’s face has the shape of Mickey on it.” But it didn’t even take me a split second to realise that my reasoning was a little far-fetched. 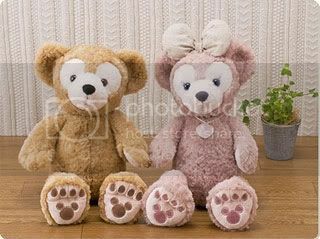 I walked on and noticed, the bears come in all sizes and there appears to be a male and female (the pink one with ribbon) version of it. Some were carrying the bears naked (“naked” modifies “bears”, not the people carrying them) while others were carrying them with clothes on. To make things more unfathomable, different clothes. I stepped into the souvenir shop at The Little Mermaid corner and saw an entire section dedicated to selling the bears and I learnt that they are the Disney bears, Duffy and Shellie May. They’ve actually got names O_O! I couldn’t and still can’t figure out why they’re such a big hit in Japan. Granted, the face has the shape of Mickey and its feet has got Mickey’s silhouette too but aside from that, it doesn’t even look remotely Disney. Disney has gained such wide fellowship, it no longer needs to be framed in its perceived image. The next thing you know, the shops are filled with plush toys that look like the blue man and red woman that tell you where to relieve yourself. hey. came across your blog while googling for the jet programme. if i’m not wrong duffy is mickey’s stuffed toy? It feels kinda weird addressing you that way. Same reason why I didn’t address Anon as Anon coz it just means anonymous right. Haha… Anyway, I actually did a search online the day I returned from Disneysea and found that it’s exactly as you said. Apparently, Duffy only appeared for a bit as Mickey’s toy and he was merely known as the teddy bear when he first appeared. I don’t know the details following that but somehow they gave him a name and created Shellie May later. haha same thing happened to me – went to disneysea, couldn’t figure out why this foreign bear was appearing practically everywhere & came home to search for answers. hmm i don’t remember where i read it from, but it seems that duffy was made by minnie for mickey? if this little bit of info helps?